The Senior and Junior Poetry Prizes for this year have been launched. 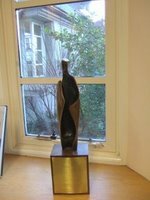 The Senior Prize (trophy in memory of Peter Dix, pictured) has as its themes Journeys, Memory, and/or Beginnings, and the Junior theme is Time. Full details are posted in school now, and entries go to Mr Canning (senior) and Ms Smith (junior) in due course. As always, the winners and many of the best entries will be posted on this blog early next term.